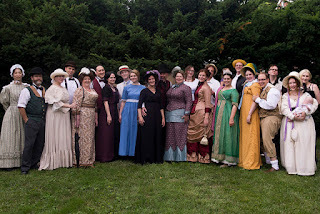 My good friend madamemodiste's Annual Victorian Party was this past weekend! 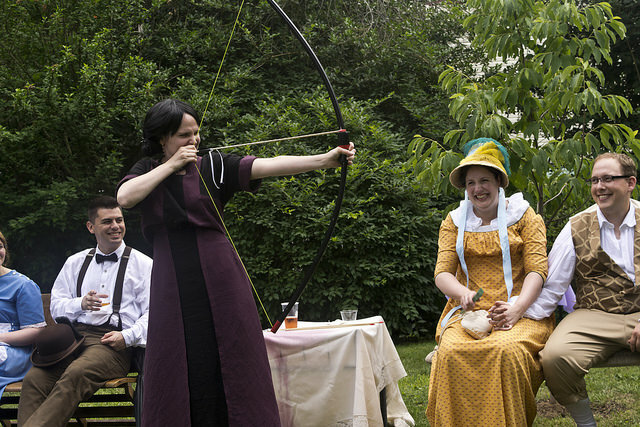 She graciously invites friends and costumers to her place every year for a day of food, laughter & fun under a tent in her backyard, in lovely summer fashion! Costumes from 1800-1900 or thereabouts are welcomed. I try to make this one every year if I can, because she is always such a gracious hostess and the fun, oh the fun, despite the heat & humidity, we ALWAYS have a fantastic time! 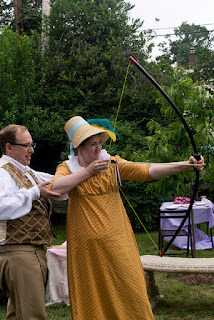 This year she had a special event of archery, which was really, really fun: I haven't done archery since my childhood summer camp days long ago, so this was amusing to see how little I remembered! 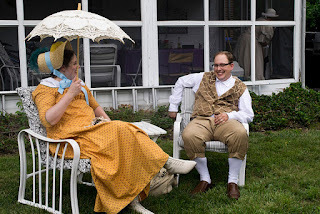 I had planned to make a white Victorian summer bustle, but alas, life happened, so instead I wore my early 19th century 'Strawberry Picking' Regency dress (made a few years ago for Regency Pumpkin Tea), loosely based on the S&S Regency gown pattern, paired with a chemisette my mother made, a straw bonnet I purchased from my friend Maggie, and my American Duchess 'Hartfield' boots! Lots of delicious summer picnic food including fruit, tea sandwiches, cheese, salami, pasta salads, fried chicken, and much more, plus lots of drinks - our hostess even made a pretty pink cake that ended up crashing on itself, that was ABSOLUTELY delicious! Much fun was had by all, especially when it came to archery. I forgot my good camera, and only took two pictures and one video with my iPhone, so I've included a few photos taken by my good friend, quincy134 of inthelongrun: she got some beautiful shots of the day! 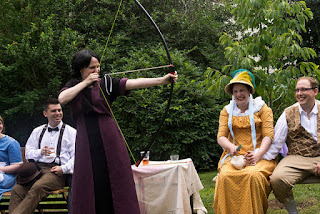 This pretty much sums up how much fun we had: my friend from learningtocostume is taking a turn at archery here, and you can see us all laughing and laughing! There were a lot of archery shenanigans that day. Here is my HB and I enjoying the day - it was SO hot & humid, but we still had a GREAT day! Thank you, Kat, for hostessing such a lovely & fun party, it was FABULOUS! We had a wonderful time! 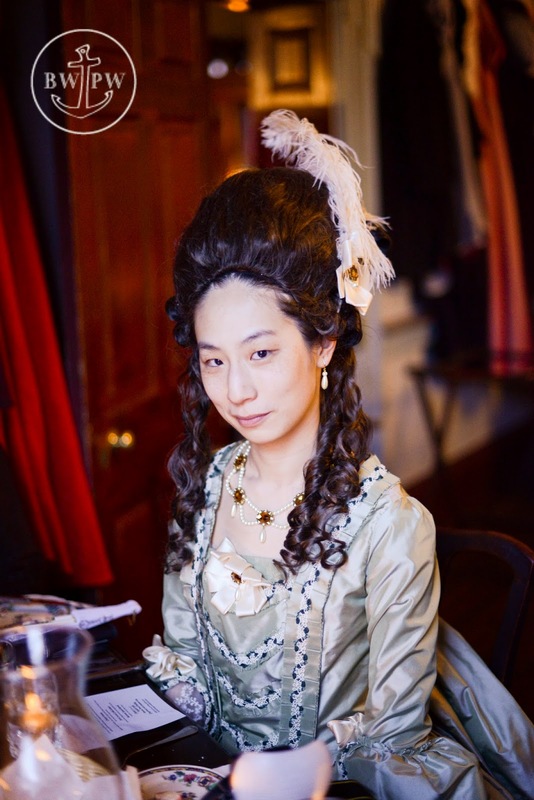 My blog post is quite a bit late, but I still wanted to post about the 4th Annual Francaise Dinner on March 28, 2015! Gloria, of In The Long Run Designs, and Maggie, of Maggie's Costume Wardrobe, and I were the hostesses this year, our first time planning this wonderful and fun event! 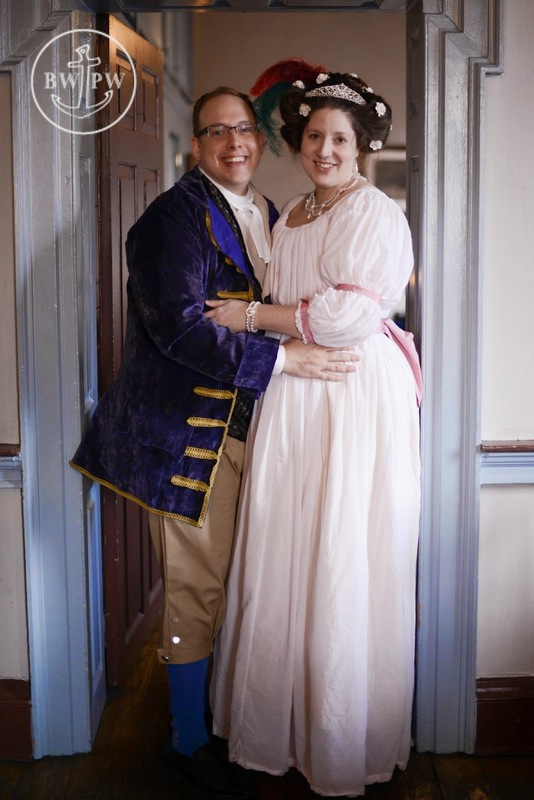 Our friends Kat, of Madam Modiste, and Judy, of Learning to Costume, founded this event and took turns hosting the first three years, and this year we took a turn! 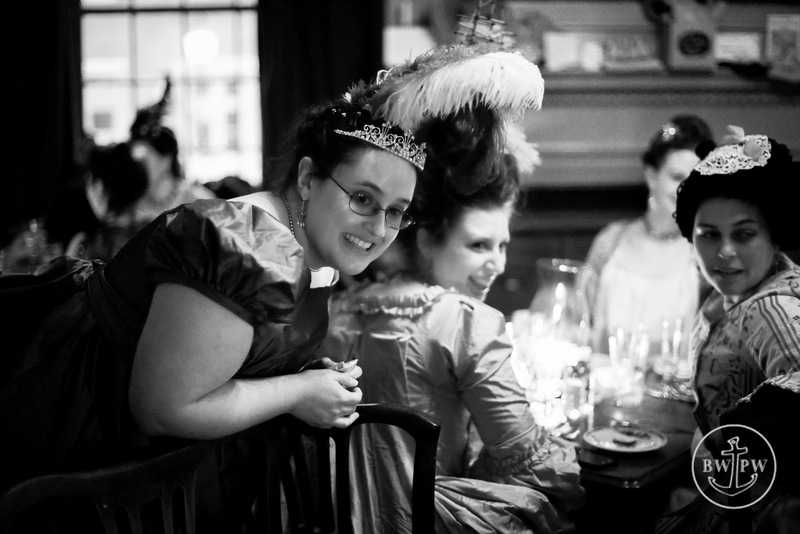 We decided to bring the late 18th century costumed dinner to Alexandria, VA to historic Gadsby's Tavern Restaurant this year, which turned about to be a great venue: they were so accommodating, the food was delicious, and the atmosphere was great: we had some fun in all our big poufy dresses getting around the room, but it was a wonderful venue! A few of us met for dinner on Friday night in Alexandria, which turned out to be a blast, and much delicious yet pricey food was consumed! On to the actual event: I re-wore my trusty Chemise a la Reina, which looks white but is actually dyed very very light pink: I wore a lovely necklace and bracelets from In the long run designs, and some lovely white paper roses in my hair from dames a la mode! I have some seriously lovely silk just waiting for me to make an 18th century Robe a la Francaise, but with all the time it took to plan & host this event, plus life stuff, plus I needed to finish trimming my HB's jacket, my dreams of making a dress for this year's event had to go on hold another year. *sigh* maybe next year! Everyone seemed to have a lovely time, the food was delicious, the raffle went well, we had raffle donations from quite a few folks, and had some lovely goodie bags for our guests to take home as well, including some lovely custom 'Francaise Dinner 2015' mirrors from American Duchess!! 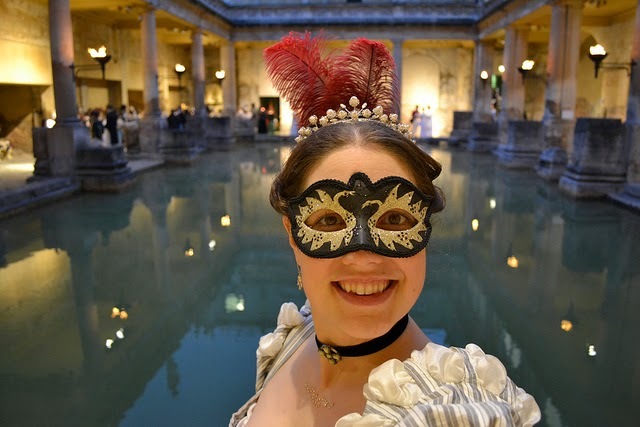 The evening went by so quickly, but I had a great time, and spent much of the evening just trying to make the rounds and greet all our lovely guests! Hope you can join in for The 5th Annual Francaise Dinner in early 2016! !